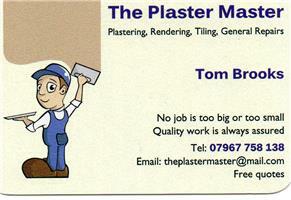 The Plaster Master - Builder, Plasterer based in Braunstone, Leicestershire. I'm a fully qualified plasterer, working on old and new residential properties. All plastering work, rendering, coving, artex, ceramic tiling. Always work in the cleanest safest way possible. Garage conversion specialists from start to finish.